There are many places for berthing in Saigo Port. Here are three places which I was instructed directly at the port office. The port office is located at 1F of the ferry building, which is at the rightmost end when you see it from the sea. See the picture. Open from 9:00 to 16:00 only on weekdays. Phone: 08512-2-4195. 1) You turn left at the right (= northeast) end of a long quay for ferries and high-speed ferries. Then there is a quay for berthing which runs toward the upper portion of the river. As it is located at a center of the town, it is convenient for yachties. The new quay is clean and painted like a tiger. Stop by the port office to introduce yourself. Attention: When I stayed there, the sea was relatively calm. Then, I don’t know the status of a day with a high surf advisory or a strong wind warning. I didn’t feel waves from ferries. However, I sometimes received waves which seemed to be topographically amplified. While I think that here is a safe berth, I also advice you to ask the port office when you will have a strong wind. 2) The both sides of a 120 m long pier running to the southeast are OK for berthing. I was surprised that it is OK for berthing. It is a highly visible big pier with a white arcade walk right ahead of you, when you move into Saigo Port. The pier was for ferries services until 2013 when a new pier was built. Now the old pier is open for sail boats. But, as some ships such as training ships of fisheries high schools will come here, the port office asks you to notice them your berthing. 3) A quay at Oda area which is in the north back of the port is another berthing place. 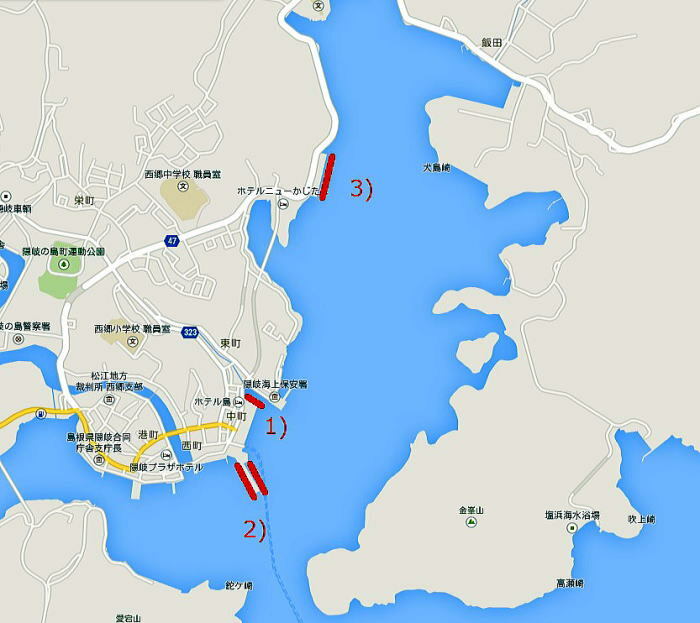 When there is strong southeast winds, and when you get strong reflecting waves from the quay of Coast Guard, it is better for you to move from the berth (1) above (or (2)) to the quay at Oda area. Again, some big ships will come here to moor, the port office asks you to notice them your berthing. I think the information above must be new on the internet. 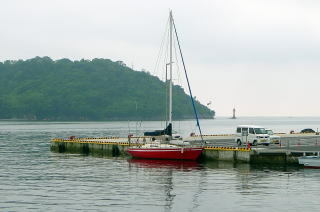 As the new ferry pier built last year in 2013, the old pier is now open for sail boats and the berthing situation of Saigo Port has been changed dramatically. 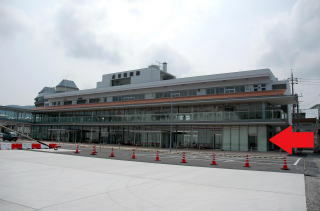 Even people at Sakai Port of the main land who know Oki Islands best didn’t knew it. Once you enter into Saigo Port, the left (= west) side area of a bended-line breakwater with a red lighthouse is a fishing port. The right side area of the bended-line breakwater is a commercial port under the jurisdiction of the port office. 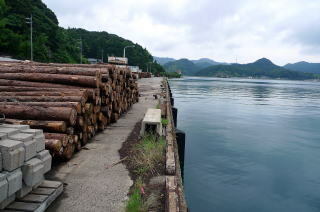 In the past, people said there was no berthing place in Saigo Port. I think people talked just only the fishing port area of Saigo Port. A warm-water-cleaning-seat-type toilet is open 7:00-18:00 at the ferry building. Another toilet is open daytime at 1F of Oki View Hotel which has the tourist information. No toilet is outside of buildings. There is a midsized supermarket which was merged with Pier and Wellness five minutes walk away. You take a seven-minute bus service for JPY 200 and get off in front of Oki Hospital to go to Sun Terrace, a big supermarket Anki Market at the base of the old ferry pier sells local fresh vegetables with low prices. I didn’t confirm the fuel service status. There are many restaurants. The combination meal, JPY 1,300, at Ryoba Restaurant which looked managed by Gyokyo (Fisheries Cooperative Association) located at the side of the ferry building seemed to be just for tourists. I ate another daily combination meal, JPY 900, at Oki Restaurant, where local people were coming. It was just a usual meal. Another restaurant Ajinokura looked good though, I didn’t enter because of a shop holiday. Ask the tourist information for more. No water is taken even at the toilet. 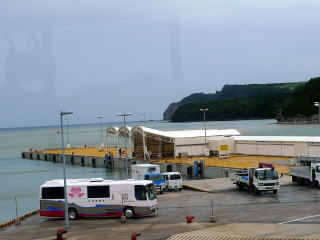 In my case, a port office guy took me to Oki Cargo Ferry Office and asked them to take the water. It was helpful. If you ask them a bag of water, it will be OK. If you need more, ask Oki Ferry to use a water horse embedded in the quay. There is a coin laundry in front of Oki Hospital. 15-20 minutes walk or 8 minutes bus away.